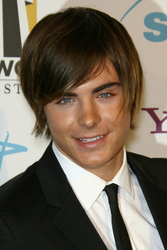 Actor Zac Efron (High School Musical, Hairspray) has been named the "Most Wanted" Celebrity of 2007 by ContactAnyCelebrity.com, a research firm based in West Hollywood, CA that provides celebrity contact information to fans, businesses, nonprofits and the media. Michael Jackson is #2 followed by Miley Cyrus, Oprah Winfrey, Emma Watson, Avril Lavigne, John Cena, Chris Brown, Angelina Jolie and Enrique Iglesias. Interestingly, the public wants to get in touch with Michael Jackson more than any other star except Zac Efron which is probably temporary -- we'll have to wait and see. Zac Efron has been named the "Most Wanted" Celebrity of 2007 by ContactAnyCelebrity.com, a research firm based in West Hollywood, California that provides celebrity contact information to fans, businesses, nonprofits and the media. The Top 10 "Most Wanted" Celebrities of 2007 are the "most wanted" for autographs, donations, endorsements and media requests from fans, businesses, nonprofits and the media out of ContactAnyCelebrity.com's list of over 54,565 celebrities worldwide. "Even with his less-than-stellar image, Michael Jackson is #2 and would probably be #1 if it weren't for Zac Efron's immense popularity this year with his roles in 'High School Musical,' 'High School Musical 2' and 'Hairspray,'" says Jordan McAuley, ContactAnyCelebrity.com's Founder and President. "Interestingly, the public wants to get in touch with Michael Jackson more than any other star except Zac Efron which is probably temporary -- we'll have to wait and see." Most of the searches on ContactAnyCelebrity.com's online database come from fans, businesses, nonprofits and the media. They want to contact celebrities for autographed photos, charitable donations, product endorsements and media requests. The Top 10 "Most Wanted" Celebrities of 2007 is compiled from two sources: searches on ContactAnyCelebrity.com's public and private online database) plus clicks on the company's Google AdWords listings displayed on Google and across the Web. A list of the Top 100 "Most Wanted" Celebrities of 2007 is also available. ContactAnyCelebrity.com's online database contains the best mailing address, agent, manager, publicist, production company, and charitable cause for over 54,565 celebrities worldwide.